The strength of such a painting as this original scene by Montague Dawson is in its combination of mystery and familiarity. This is what Dawson does best. He had a single identity for the merchant racing ship, and her distant follower on the horizon for that matter. This ship is most probably the Clipper OBERON, a storied ship in the China and Australian Trades, as the figurehead is a near perfect match with a known Dawson painting of that Ship. Dawson made models and preliminary sketches for many paintings he would produce, and would revisit ships he admired. 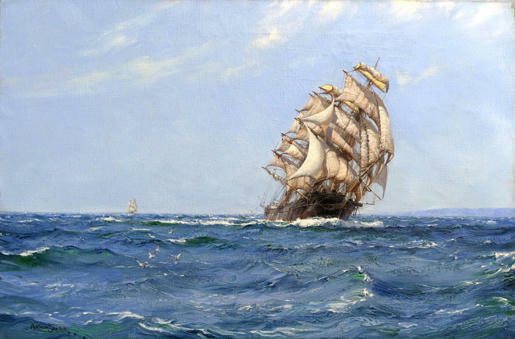 In another painting that is very similar to this work, “Clipper Days” it’s the ORIENT that’s featured, while an image that was titled “Up Channel” and widely reproduced shows the Clipper LAHLOO in her glory. Showing the crew hard at work on the bow rail, the essence of speed is with the clipper, her stunsails wide and nearly every sheet available on the three masts. The English Channel allusion of the title means that the ship is headed home, after many months abroad, and loaded with precious cargo. Wispy trails in the sky show a strong breeze and a clear path, as she beat the rival to port soundly. The wooden sailing ship is hard-driven, performing as her captain and owner demanded. Dawson’s mastery of detail and composition make this a fine work. His recognition as one of the world’s leading marine artists is enhanced by such traditional devices as the rolling bow wave and rhythmic pace of the swells within his blue sea. His recognizable technique comes forth on his following in the British Sea traditions of C. Napier Hemy and Thomas Somerscales. Montague Dawson Is widely considered the best known sea painter of the 20th Century, and one of the most skilled craftsman in the direct line of English marine artists. He is noted for his unerringly beautiful ships, the weight and surging power of his waves and the scudding grace of his skies. In a painting by Dawson, the elements and the ships are one, united in a harmony of motion and color which immediately rings true. Dawson was born in Chiswick, England, the son of an enthusiastic Thames yachtsman and grandson of noted English landscape painter Henry Dawson. Early in his life the Dawson family moved to Southampton where he spent his time fishing, sailing and watching the great ships of the world anchoring in the harbor. As a young naval officer during WWI, he met and was greatly influenced by English artist C. Napier Hemy and would spend the remainder of his life as a professional painter and illustrator. Today works by Montague Dawson grace the private collections of royalty and presidents as well as important museums worldwide. His reputation as "the King of the Clipper Ship Artists" has penetrated into every part of the civilized world. He was a master of his genre, the like of which we may never see again.